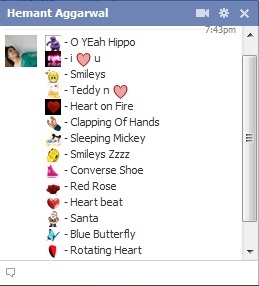 We found out some nice codes that can be used in Facebook chat which result in animated icons. There are codes for displaying animated Converse shoe, sleeping mickey, Hippo, Santa, rotating heart and many more. The codes are given at the end and can be implemented easily using copy paste method.